After leisurely savouring your breakfast omelette, you collect your book and head to the Skyline car. There, you'll sip, read, socialise... and scan the panoramic view for a glimpse of elk moving across the valley. 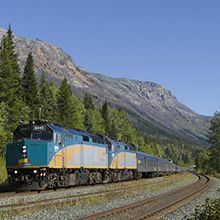 The Toronto-Vancouver train, which takes four days to travel between one of Canada's largest cities and the Pacific Coast, lets you see the breadth of the country like never before. Take in boreal forests reflecting on the surface of the Great Lakes. Prairie sunsets painting vast skies in shades of fire. Mountain peaks towering above as the train winds through the Rockies.